Joy loves her daughter Piper very much and will do anything for her. When Piper asks for a white Christmas Joy decides to spend it with her in-laws in Glacier Creek, Montana. Joy is a widow and it's difficult for both her and Piper's grandparents to spend Christmas without Matt. Fortunately Cole is there to show them around and introduce them to all the good things Glacier Creek has to offer. Matt was Cole's best friend and Cole is like a son to Matt's parents. He wants to dislike Joy for taking Matt away from him, but when he meets her and Piper he's smitten. Joy wants Piper to have a nice holiday, but this proves to be more difficult than she thought. There are no decorations in the house and nobody is particularly looking forward to Christmas. Her arrival isn't accident free and later tragedy strikes again. Was it really a good idea to come to Montana and will Joy be able to fulfill all of her daughter's wishes or will Christmas in Glacier Creek be a disaster? A Hummingbird Christmas is a heartwarming romantic story. Joy is a kind and dedicated mother. She's talented, patient and incredibly sweet. Piper is adorable, she's an adventurous and outspoken little girl with plenty of interests. Cole is a wonderful man with a good heart. They've all been through a lot and therefore Christmas isn't easy for them, but they're trying to make the best of it. Piper deserves a special Christmas and I loved how Joy and Cole are trying to make that happen for her. It's clear from the beginning that Cole belongs with Joy and Piper. They have a beautiful connection and I couldn't wait to find out what would happen if they'd admit their feelings. There are plenty of sparks between Joy and Cole and this together with the gorgeous family bond made the story extra amazing. Karen Foley has a warm and welcoming writing style. She writes about a lovely small town covered in snow. Glacier Creek is the perfect setting for a festive story. While her main characters are grieving their story is also filled with hope, love and light. It's a terrific combination that put tears in my eyes and a big smile on my face at the same time. A Hummingbird Christmas is a fantastic holiday story, I really enjoyed reading this charming and endearing book. 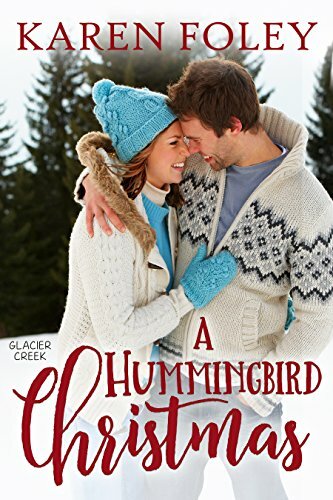 If you love small town romance and like Christmas stories A Hummingbird Christmas would be an excellent choice. What I like about this story is that it covers not only the wife/daughter's pain for Matt loss, but Matt's parents and best friend as well...Christmas should be a moment of joy, I hope this book as an happy end for all the characters. This sounds like a lovely read. Thanks! I love small town romances. Sounds interesting plus the cover looks cute! I love reading Christmas romance books, expecialy during the holidays. I wish I could experience a real snowy white Christmas but until I do I'm happy to read about them. I bet Piper steals every scene that she is in. I think this will be a tear jerker.